I always opt out of the full scan. Always have. No concerns about health, really. Just some serious misgivings about being scanned while my hands are held over my head in surrender. The whole prospect is distasteful. Anyway, I have done this enough to know I’m going to get a full body pat-down. Also distasteful, maybe just a millimeter less so, but what can I do? Driving is really not an option for business, whatever the government wants to say about “other reasonable options”. I have had pretty good experiences with this, to be honest. The people giving the pat-downs have been friendly, joking, making light, conversational and overall polite. I’ve had the feeling that they saw the absurdity as much as I, and were just trying to get through the day. After Thomas (didn’t get his full name) finished handing out terse commands for a couple minutes, and said I was free to go, I asked if I could offer some advice. Sure, he says. “No, I won’t. You are going through my security, not me through yours.” And then he turned and walked off. I talked to another gentleman from TSA, who was watching all the flows, standing apart, looking somewhat manager-ly. He was friendly, understanding. Said he’d talk to the guy. Maybe he will. Let’s hope the rest of the journey home can proceed with a little bit more congeniality. Twenty-Five bottles of thoroughly nutmeg-soaked mead bottled this evening. This after getting my 11 year old, Sean, set up and running on a developer edition of SalesForce and Trailhead to go with it. This after a lovely lunch of pasta with Bolognese (made the night before), chouriço in olive oil, and a nice side salad. This after a power-packed message by the pastor. There’s a game tonight? Oops. Slipped my mind. A very kind friend handed me their second copy of Marcela Hazan’s The Classic Italian Cookbook, essentially for Christmas. Tuesdays are normally the night I teach ESL, but the semester doesn’t start until next Tuesday. 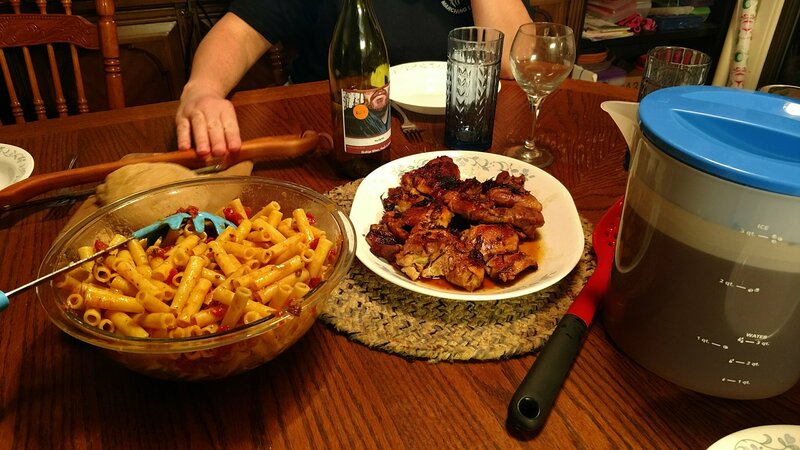 So…free night with limited budget means simple italian cooking! While I did not serve in courses, as first course I made Ziti al sugo di pomodoro e funghi (Ziti with a sauce of tomatoes and mushrooms), modifying the book’s Penne al sugo di pomodoro e funghi secchi quite dramatically, though still quite tastily. Really, almost the same, but none of the woodsy, earthiness to be expected when using dried wild mushrooms, rather than white mushrooms from Publix. For secondi, I tried my hand at Pollo arrosto in tegame, Pan-roasted chicken with garlic, rosemary, and white wine. It turned out very well, with slight modifications! I have copious amounts of peach and nectarine wines on hand. A nice medium-sweet nectarine wine was lovely both as beverage-during-the-meal and sauce component. 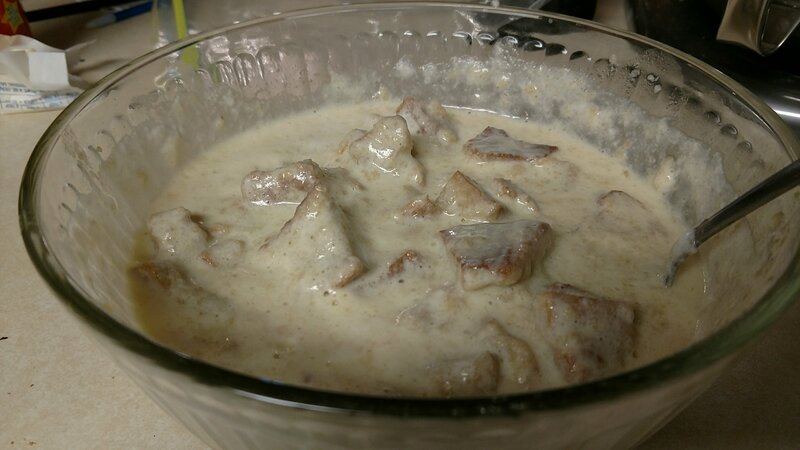 I did maybe overdo the chicken thighs a bit, but only a bit. Plan to serve the pudding the day after you make it. It improves in texture and flavor as it rests. You can refrigerate it for several days, but always take it out sufficiently ahead of time to serve it at room temperature. Oh, sure, it is just a suggestion. But, I was raised to treat suggestions with greater than normal respect. We will wait. 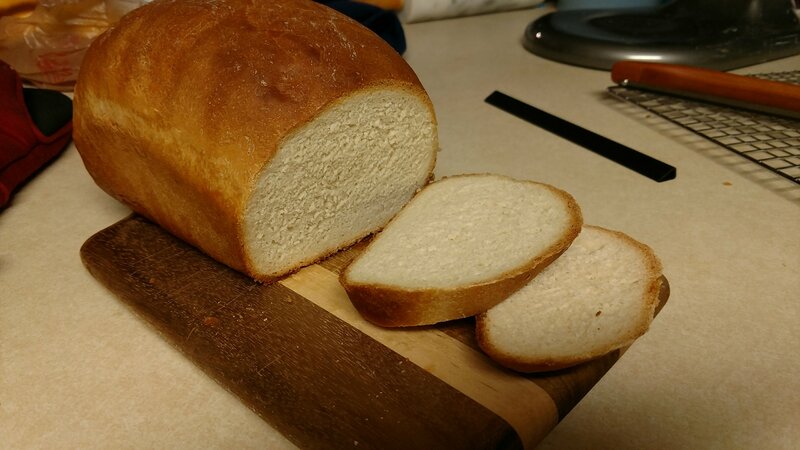 A lovely, slightly dense, white bread. And a lovely colored/textured crust, too. So, I call that a success. Oh, and it tastes great amazing. Neither of the two loaves expanded to fill its pan. One turned out beautiful, in spite of that, while the other has a hideous facade (other than the shade of the crust). Could be the yeast (which is out of date, though it quite successfully started off a ginger bug last month) or the rupture of flour that resulted in uncertain measurement. Returning from holiday in South Dakota, I was encouraged to attempt some baking again. I had made breakfast for the family, done a small puzzle, done the bills, returned library books. Why not some of the bread-y arts? While I cook often enough, and enjoy doing so, baking has never been my strong suit. In any case, a simple white bread should be no trouble, right? That would be the explosion of flour that spread across my kitchen as I began mixing. Grrrrr. Now, with cleaning done (easier than I thought, even if annoying), and bread dough rising, I can be a little more optimistic. Still, I have no idea how much flour I actually ended up using, as significant quantities were lost. I really don’t know if I was more or less than recipe amount (6 1/2 cups). The kneading was uncertain. I am not sure I ever really got “smooth and elastic”. Enough for now. More in a couple hours!